Continuity mistake: When the rear window of the semi is smashed, you can see in the very next shot that the chain of Wez's ball mace is already hanging from the ceiling to Max's right, long before Wez even starts swinging it and leaves it hanging there after he is killed. Continuity mistake: After his crash, Max is hiding behind a rock. He draws his shotgun out, and you can see he has no glove on his right hand. Then the interceptor explodes, and he shields his face with his right hand, which now has a glove on it. Revealing mistake: When the tanker crashes at the end the driver is clearly wearing a crash helmet. Continuity mistake: When Max sneaks up on the raider who's sitting at the wrecked dune buggy with the dying woman and man, look at the crossbow on the ground. At first it's unloaded. Then when the raider sees Max, he reaches for it and it's suddenly loaded and ready to fire. Continuity mistake: When Max's interceptor rolls down the hill, on its last roll you can see one of the fuel doors pop open (which should actually set off the booby trap and cause the car to explode). When Toadie arrives to look at the tanks, both the doors are now closed. Revealing mistake: When the gyro captain crashes, the rotor on the craft is already bent before it hits the ground. Continuity mistake: Throughout the whole film, Max's interceptor has windshield wipers attached sometimes, and sometimes it doesn't. Probably because they were using more than one interceptor for the movie. 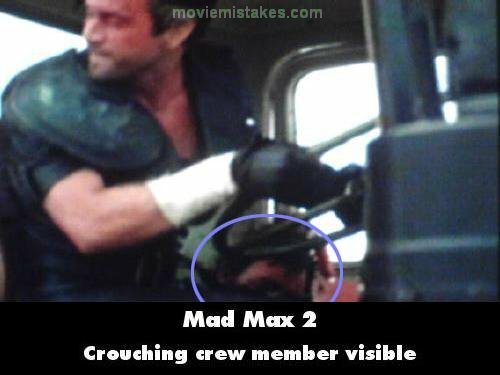 Visible crew/equipment: In the final truck chase scene, Wez shoots Warrior Woman with a quad-barrel arrow gun. In the shot where the arrows impact on her, a guide wire for one of the arrows (red-tailed one) is visible. Other mistake: When Max is making his escape from the compound in the Interceptor, he turns on the blower to speed through the bad guys' camp. Here you can see everyone running at fast-forward speed. Revealing mistake: When the gyro thing is in the air and that bloke grabs the snake you can clearly see that it is a rubber snake. Factual error: There's no way the gyro helicopter could carry 2 men and four jerrycans of petrol across a desert. It is only built for one person and would never lift off. And where would they put the second person and petrol anyway? Deliberate mistake: When Max opens the dog food, the lid should be all jagged because of the type of can opener he uses, but when dog and the gyro captain have the can the lid is cut smoothly. This was done so dog didn't get cut whilst eating out of the can. Visible crew/equipment: In the initial chase of the semi, as we see the view from the Gyro copter viewpoint, just before the semi turns, the camera and operator are plainly visible in the buggy behind the motorcycle. Revealing mistake: When the warrior woman cuts the bikers throat who is trying to grab the woman through the side window of the van its obvious that the knife does not even touch the mans throat, its positioned at his chest and she doesn't even cut the clothing he's wearing. Other mistake: The climactic chase scene at the end of the movie has us believe that the tanker being driven by Max is full of "precious fuel", which is why The Humongous and his goons are desperately trying to halt it. But during one shot, the ending of the movie is spoiled because red dirt is seen spilling from one of the pipes leading to the tank. The climax of the movie, of course, is when Max discovers that he was used as a decoy hauling dirt, not fuel. But when the dirt is seen spewing from the tanker in an earlier shot, that surprise is ruined. 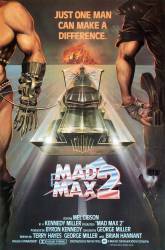 Factual error: Mad Max turns on his engine blower with a switch. The blower in Max's car is driven by a belt attached to the engine itself. The only way to turn it off is to turn off the engine. It is possible to put the blower on an electric motor, but turning it off would simply shut off the oxygen and fuel, both of which are pretty important in an internal-combustion engine. The Gyro Captain: No! It's my snake, I trained it, I'm going to eat it! I got a recipe for snake. Delicious. Fricassee of reptile. You are what you eat. When Max opens the Semi's door, a dead body falls out. This body is actually the same "eye popping" dummy that was used at the end of Mad Max 1.